If you read my review of the book, Oracle Year, I mentioned that Charles Soule writes for comic books, this is one of them that I've kept up on, and have read from start to finish, as this run ends at #25, though Charles Soule will have more to write for Marvel in the Star Wars world. This series starts moments after the end of Star Wars episode 3, Revenge of the Sith, and tells the story of both Darth Vader becoming the Dark Jedi Master under Palpatine, but also tells of the growth of the Empire during that time. It has four main arcs, The Chosen One (issues 1 - 6), The Dying Light (7-10) The Burning Seas (13-17) and Fortress Vader (19-25). This is a comic book run, so I need to take a moment to really appreciate how well done the art is on this whole book from Giuseppe Camuncoli's layouts, the finishes of Cam Smith then Daniele Orlandini, colors by David Curiel and Dono Sanchez-Almara, and the Lettering by Joe Caramagna. The cover shown to the right was done by Jim Cheung and Matthew Wilson (with other cover artists throughout the run). For any run to go this long with so few personnel changes seems like an accomplishment these days. The art is a very cinematic take, like most of the Star Wars comics, making the characters in the books look very similar to the actors that play them in the movies, which makes characters from the Rebels cartoon series seem more real, in a way. I disliked Star Wars Episode 1 so much that I'd never seen Clone Wars or Revenge of the Sith. I've literally seen everything else that the franchise has to offer, and this comic run has been amazing. It actually has me thinking that I should be willing to watch those other prequel movies. 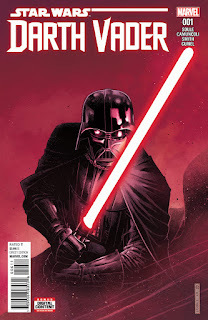 Maybe that is a mistake, but before this, I really didn't care about Vader and his origin story. Now I do. I don't like everything that Charles Soule writes, but when he is in my lane, he is a great writer. Read this if you want to know more about this story. Like the other Star Wars books I've written about, if you aren't into Star Wars, feel free to skip this. I have read this book, issue by issue as it came out from initial release, monthly until the last issue, #25. Note: I finally did watch the second and third Prequels on New Year's Day.